This new twin turbocharged V6 is closed based on the 3.6L V6 that has been hard at work for some time across the entire General Motors product portfolio but in addition to the two turbochargers, GM engineers have gone with new cylinder head and block castings, strengthened internal components including the pistons and connecting rods and a new fuel system to feed the powerful engine. When the new twin turbo V6 hits showrooms later this year, it will officially be the most powerful six cylinder engine ever offered by General Motors. 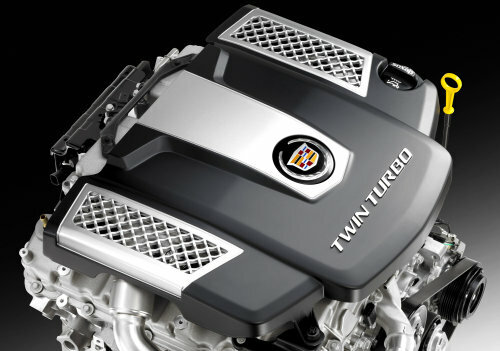 With 420 horsepower and 430lb-ft of torque, the new Cadillac twin turbo V6 offers significantly more power than the twin turbocharged V8 from the BMW 550i (400hp). The video at the end of this piece shows a computer generated look at this powerful, efficient new twin turbo V6 in action. The 420 horsepower and 430lb-ft of torque is channeled to the rear wheels via a new 8-speed automatic transmission that will afford the 2014 Cadillac CTS a great mix of strong acceleration and great fuel economy. The new twin turbo 3.6L V6 in the 2014 CTS will allow this midsized sedan to dash from 0 to 60 miles per hour in just 4.6 seconds while reaching a top speed of 170mph. For comparison, the high end 2013 Cadillac CTS-V with the 556 supercharged V8 hits 60 from a stop in 3.9 seconds while the previous generation got to 60 in the same 4.6 seconds as the upcoming CTS. Also, General Motors expects that the 2014 CTS fitted with the twin turbo V6 and the new 8-speed automatic transmission will be able to achieve 17 miles per gallon around town and 25mpg on the open road – although those are estimated figures. We can expect official EPA fuel economy figures closer to the launch of the twin turbo 2014 CTS. Should the EPA certify those figures, the new CTS will offer incredible fuel economy for a vehicle that can get to 60mph in the mid 4 second range. In addition to the new twin turbocharged 3.6L V6, the 2014 Cadillac CTS will also feature the naturally aspirated 3.6L V6 at work in the current CTS as well as the turbocharged 4-cylinder engine from the current Cadillac ATS. The 2.0L turbo 4-cylinder is expected to offer 272 horsepower and 295lb-ft of torque while the naturally aspirated V6 should pack somewhere in the area of 321 horsepower and 275lb-ft of torque. Both of those engines will be available in either rear or all wheel drive with the most efficient option – the rear drive 2.0L turbo engine – offering around 30 miles per gallon on the highway. We can expect that the current V6 will be the base engine while the turbo 2.0L and the twin turbo V6 will serve as optional upgrades for the next generation Cadillac CTS. Also, we can expect that the 2014 Cadillac XTS premium sedan will also offer the new twin turbocharged V6 starting later this year in addition to the current 3.6L V6 that is the only engine option for the brand’s range topping luxury sedan.